The enigmatic acritarchs. | Letters from Gondwana. Acritarchs are a heterogeneous and polyphyletic group of organic-walled microfossils of unknown affinity, consisting of a central cavity enclosed by a wall of single or multiple layers, with a great variability of shapes and ornamentations. The wall is made by sporopollenine or a very similar compound and the size range is about 5 to 200 micrometers. Palaeozoic acritarchs. Images from the Natural History Museum database. The term was first introduced by Evitt in 1963 and means “undecided origin” (from the Greek akritos = undecided, and arche = origin”), and replaced the older group “hystricosphaerid”(1). 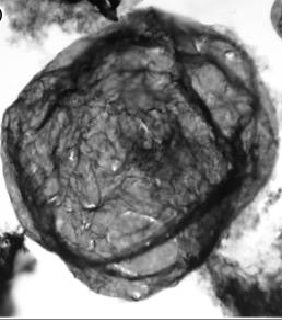 When Evitt (1961, 1963) and Wall (1965) proved that many Mesozoic “hystrichosphaerids” were in fact dinoflagellate cysts, the remaining forms of the hystrichosphaerids were classified as “acritarch”. Based on their morphology, acritarchs are divided in nine groups. Diagram showing the different group of Acritarchs. Imagen from UCL. The first record of acritarcs belongs to the Proterozoic (1400 mya) and the range extends to the present time, although the highest point correspond to the early Paleozoic. Those early forms were almost spherical with a simple opening mechanism in many cases. During the Cambrian, acritarchs reached a more complexity of forms, and become especially diverse during the Ordovician. 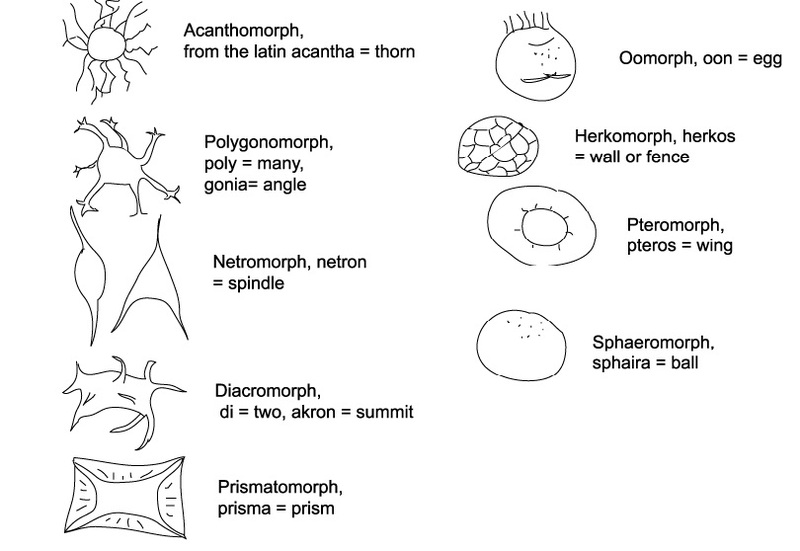 Some acritarchs showing the diversity of forms within the group. Images from UCL. Because their size, abundance and diversity, as well as widespread distribution, acritarchs are very useful in biostratigraphic correlation and paleoenviromental reconstructions. For instance, the Cambrian/Ordovician system boundary in Arctic Russia was established using acritarchs (3). Skiagia ornata, from the Early Cambrian. Image from the Museum of Geology, University of Tartu. But the diversity of the acritarchs rapidly declined at the end of the Devonian and became a modest group during the Carboniferous and Permian. 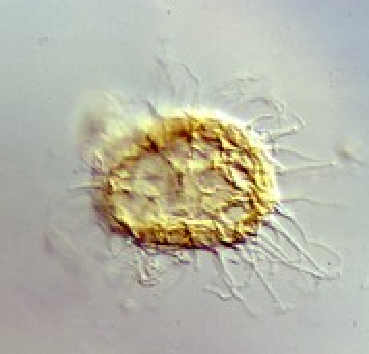 After the Early Jurassic, acritarchs are scarce and replaced ecologically by the dinoflagellates and many forms considered before as acritarchs are now clasified as prasinophytes or other green algae. (1) Evitt, W.R. 1963. 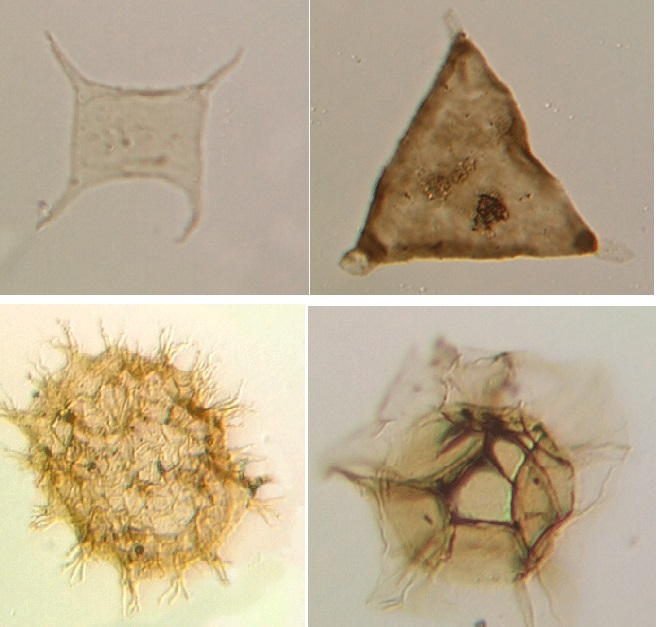 A discussion and proposals concerning fossil dinoflagellates, hystrichospheres and acritarchs. Proceedings of the National Academy of Sciences of the United States of America. Washington, 49(2-3): 158-164. Pingback: The origin of modern phytoplankton. | Letters from Gondwana.